I recently had the great pleasure of guiding a client on one of our streams, to fly fish for the resident browns and rainbows that inhabit that stretch of water. The trip had been put off more than once, it is early season here, the weather is unpredictable and the waters had alternately been fishable and then again not, in a random cycle determined by the rain. The situation changing daily as the last cold fronts of winter wrapped around the coast. Night time temperatures on the mountain tops were still only scratching their way above zero and the waterfalls were still showing on the high ground but eventually an opportunity presented itself. A day only just prior to my client’s departure back home to warmer climes in Australia, and one which offered hope of some sunshine and light winds, squeezed between two cold fronts and more inclement weather. I didn’t sleep well the night before, I take the fishing opportunities of my clients seriously and was worried about the winds and the water levels, saying little prayers to the fishing Gods that all would be well in the morning. We set off early, negotiating some of the congested commuter traffic that afflicts every major city these days, but heading mostly in the opposite direction to the business suited go-getters struggling to get their RV’s out of first gear and so weren’t greatly delayed. It was very windy en-route and Matt commented that “it would blow a dog off a chain”, these Aussies do come up with some cracking comments and I had to laugh. I was just hoping that the weather predictions of “light air” would hold true on the river. There was still a stiff breeze when we reached the stream but it wasn’t impossible and we hoped that it would wane as things warmed a little later on, it was decidedly chilly whilst tackling up. The river was high, but not too high for the wider stretch that I had booked to fish. The water still markedly amber in hue but clear as a bell, these streams rarely actually get dirty unless the forsaken fish farm higher up is doing something foolish with their outflows or diggers, although good sense hasn’t necessarily been their strong suit in the past. The first crossing of the stream was a shock, the water still decidedly chilly, as we forded a fast flowing and frigid tributary, I put on my brave “I’m and outdoorsman and professional guide” face and my client his “Don’t let these Springbok fellows think that the Aussies are softies” face. Still we both arrived safely on the other side, having avoided an early morning swim and set about trying to find some fish. The first runs were unproductive, the sun was yet to climb above the mountain tops and the air was nippy. As we progressed upstream, carefully searching we spooked a trout and saw one other rise but managed to scare that one too before we could persuade it to take an artificial. There were lots of micro caddis on the rocks and I was expecting to see more activity from the fish, alas they weren’t really “on”. I gradually began to worry that the next day’s predicted cold front, and the barometric pressure drop that accompanies these events was putting the fish off, I do generally believe that this is frequently the case, but we persevered. Then a take to the nymph, missed out of a lack of expectation but at least it was a feeding fish. Another trout missed, this time on the dry, but they did at least seem to be feeding a little more than had previously been the case. Eventually the sun came out; we warmed up, sitting out of the water on the rocks, and ate a sandwich or two before continuing further upstream. 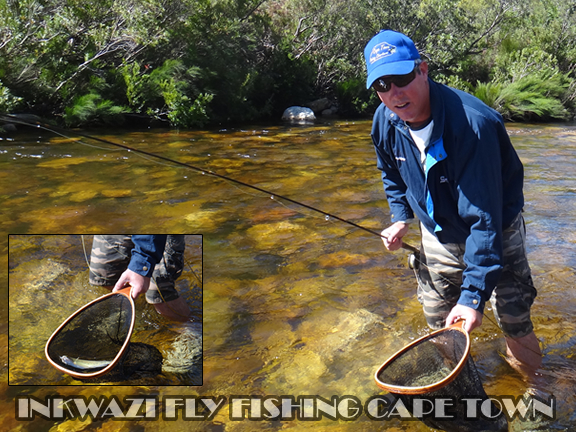 We changed flies, lengthened leaders and generally fiddled with the gear in the hope that it would make a difference. Then another take on the subsurface fly, and a hook up, but only a brief one, before the fish came off. Matt was getting closer and I have seen this progression on numerous occasions with neophyte anglers, one simply has to carry on working at it, a missed take, then a lost fish and hopefully at some point success. In the pocket water several more fish were missed on both the dry and the nymph and finally a solid hook up and the leader parted, perhaps a wind knot had affected the strength of the tippet or Matt had forgotten himself and was hauling back as though playing milkfish in his home waters. Either way, another opportunity gone but still moving inexorably towards our goal. Then a long run, shallow water and all manner of possible holding positions for fish in the higher than average flows. Carefully “shotgunning” the run with sequential casts finally resulted in another take to the nymph and a solid hook up. Panic as Matt now a little unsure how hard to pull, when to let the fish run or when to hold, but finally a trout in the net. Matt’s very first trout on fly… a special moment. It was all smiles and for me as much as the client the pressure was now off. Nothing offers quite so much relief to an angler as that first fish, never mind that it is the absolute first. Matt’s first ever trout on the fly. It got me to thinking about the first trout I ever captured on fly. I was using a fibreglass rod, purchased with hard saved pocket money, a level Terylene line which required regular drying and anointing with Mucilin floatant paste. I don’t recall the leader set up, probably level nylon, and a fly which I vaguely recall was a “Sherry Spinner” pattern, purchased from the local fishing tackle and pet shop (such combinations of business were quite common back then). I had been catching small dace in a section of the local canal, flat calm water and not the sort of venue I would choose these days to throw a line. Having captured several small dace, small enough that they would invariably fly through the air on the strike, I hooked a small trout, probably less than six inches long and a native brownie. My first ever. Since then I have captured thousands, probably tens of thousands of fish on fly, but I can still close my eyes and remember that section of the canal, the reed beds on the far side, and the dimpling rises of those tiny dace. I can see the tangled lines and dangling flies caught up in the telephone wires above my head were we had on previous occasions been overzealous with our casts. I can picture my little red bicycle lying in a heap in the grass, thoughtlessly discarded the moment I had seen rising fish, and the foolish striped cap that served in those days as my fishing hat. That small trout was the beginning of an adventure, perhaps an addiction, which has never left me. It has no doubt shaped my life, for better and worse. When I am able to assist someone like Matt catch his first trout, I am still never sure if I have helped open the door to lifelong passion or unleashed a monster of wayward and self-indulgent time wasting. Mostly I suspect that the answer to that question depends on whether one asks the angler or his family.